Is your child interested in learning more about volleyball? Whether kids are learning for the first time or improving fundamental skills, there are quite a few opportunities for kids to play volleyball! Check out these classes and clinics — as well as more competitive leagues. Ages range from preschool all the way into high school. This article is sponsored by Lions Jrs. Volleyball for kids! The Lions Jrs. Fall League is a fun, cost effective way for players to learn or enhance volleyball skills. Teams are coached by parent volunteers and the practices are run by experienced Lions staff. This convenient league allows you to choose your practice day and location. The Lions Jrs. Fall League has experienced tremendous growth since its inception in 2008, with nearly 1,500 players and almost 150 teams participating. The Fall league for 1st-8th graders will run for 8 weeks, with practice beginning the week of September 3rd. 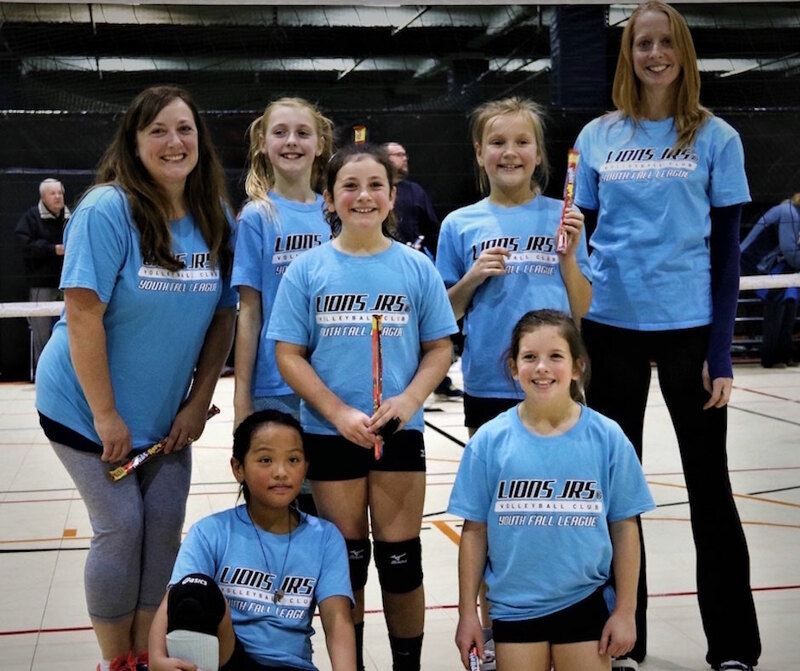 Lions Jrs other offerings include a youth winter league for grades 3rd-5th, a volleycubs program for ages 4.5-6.5 and Nationally competitive club program for 6th-12th. An 8-week league is offered for players interested in improving their volleyball skills. Grades 1 – 8. An 8-week league offered in the city and surrounding suburbs. Grades Pre-K – 8, but not all ages offered at each location. Teams, clinics, camps and private instruction are offered for children ages 5 years old and up. Learn the basics in Darien’s co-ed program. Teams are divided into two leagues, grades 3 – 5 and grades 6 – 8. This league consists of two weeks of practice, then the remaining weeks playing matches. League does not start until January, and is for grades 3 – 8. This league consists of practices one night during the week, and games played on Friday nights. Participation is for grades 3 – 8, with sessions beginning the first week of October. Tryouts are the first week of October, for girls ages 9 – 18. Illinois Performance Volleyball Club offers a variety of options for girls interested in playing volleyball. Volleylites for younger children learning the fundamentals, and 3rd – 7th graders can focus on skill work and team activities. Private and group lessons are also available, as well as club teams 12u through 18u. Clubs, clinics, leagues, and skill lessons are all available. Clubs have a variety of levels depending on performance and player interest. Leagues compete in-house. Both boys and girls teams, with ages and availability range from K through 12th grade. Not all ages available during every season. Register online via the park district’s website for these offerings. Some park districts did not have their fall/winter schedules available as of July 27, 2018. Call your local park district to confirm availability. Co-ed classes for ages 8 – 12. A variety of options are available through the Downers Grove Park District. Both weekly classes and leagues are available, for ages 8 – 14. Volleyball is not offered every season. Fall 2018 classes will be held on Monday nights for grades 3 – 8. Volleykidz is an introductory class for young children ages 5 – 8. Co-ed program will give players ages 6 -14 the chance to improve their fundamental volleyball skills. Lombard Park District offers a variety of levels of volleyball. Children ages 6 – 9 can take part in an introductory class, ages 9 – 14 will solidify their fundamentals, and ages 10 – 14 can take part in match play. Winter break camps are also available. For fall 2018, a few different options are available for children interested in learning the foundations of volleyball. Basic classes focus on skill work, as well as more advanced coursework and weekly match play. Ages 6 – 15. Be the first to comment on "Volleyball for Kids: Leagues, Classes, Camps"